CD28 is a coreceptor expressed on T lymphocytes. Signaling downstream of CD28 promotes multiple T cell functions such as proliferation, survival, and cytokine secretion. Adhesion to APCs is another function of T cells; however, little is known with regard to the role of CD28 in this process. Our previous studies have shown that CD28 inhibits T cell adhesion, but the underlying mechanism that mediates this process remains unknown. In the present study we discovered that signaling downstream of CD28 resulted in inhibition of Rap1 activity and decreased LFA-1–mediated adhesion. We showed that this was regulated by the recruitment of calcium-promoted Ras inactivator (CAPRI), a GTPase-activating protein, to the plasma membrane downstream of CD28 signaling. CAPRI trafficking to the plasma membrane was secondary to calcium influx and was mediated by its C2A and C2B domains. We conclude that CD28 inhibits Rap1-mediated adhesion by recruiting the protein CAPRI to the plasma membrane. The constitutively expressed T cell coreceptor CD28 is engaged by CD80/86 on the surface of APCs (1). CD28 is implicated in myriad T cell functions, including differentiation, proliferation, metabolic alteration, cytokine production, transcriptional activation, and polarization (2). Overall, these responses are considered to activate T cells. However, recent studies have shown an inhibitory outcome downstream of CD28 signaling (3–5). These results have revealed a more complex view in which CD28 signaling results in both stimulatory and inhibitory signals, most notably inhibition of T cell adhesion, an observation whose mechanism and significance need to be comprehended. T cell adhesion is an essential aspect of T cell biology. Without proper adhesion, T cells can neither traffic to appropriate compartments nor recognize Ags presented on MHC molecules. The integrin LFA-1 is critical for T cell interactions with APCs. LFA-1 affinity for its counter-ligand, ICAM-1, is regulated by Rap1, a small GTPase that cycles between active (GTP-bound) and inactive (GDP-bound) conformations (6). As is true for all small GTPases, Rap1 activation is brokered by guanine nucleotide exchange factors that induce Rap1 to release GDP in favor of GTP binding. Because the intrinsic GTP hydrolytic activity of Rap1 is limited, inactivation must be mediated by a GTPase-activating protein (GAP). Among the GAPs known to inactivate Rap1 is calcium-promoted Ras inactivator (CAPRI), a member of the GAP1 family of inactivators that is highly expressed in T cells (7). Whether Rap1 and CAPRI are associated with CD28 inhibition of adhesion is unknown. Owing to the well-established role of CD28 in costimulation of T cells, targeting CD28 in treatment of autoimmune and inflammatory disorders was an initial common goal. Despite this rationale, agents that block CD28 signaling have failed as clinical drugs (8). It has been suggested that this may be because the consequences of their actions are multifarious and inadequately understood. The observation that CD28 can result in inhibition of specific T cell functions (i.e., adhesion) represents a critical paradigmatic shift. Understanding how this is mediated will fill the gaps in this important signaling pathway and identify novel candidates for intervention that could dissociate pro- and anti-inflammatory effects of CD28 and permit manipulation of the latter. In the present study we tested the hypothesis that CD28 inhibits T cell adhesion by recruiting CAPRI to the plasma membrane (PM), resulting in Rap1 inactivation, and uncovered the molecular mechanism. RPMI 1640 medium, Dulbecco’s PBS, HBSS, FBS, and CFSE were purchased from Life Technologies. Ficoll-Paque was purchased from GE Healthcare. Ammonium-chloride-potassium lysing buffer was obtained from Lonza. Protein concentrations were measured with a bicinchoninic acid assay (Pierce). ICAM-1 and OVA were gifts from Prof. Mike Dustin (University of Oxford, Oxford, U.K.). Poly-l-lysine was obtained from Sigma-Aldrich. Primary murine T cells were obtained from spleens of 6- to 8-wk-old female mice using density gradient centrifugation followed by isolation using a Dynabeads untouched mouse T cell kit (Invitrogen). The cells were maintained in enriched media at 5% CO2 and at 37°C. Constructs were introduced into the cells by nucleofection (Lonza), and a transfection efficiency of 50–70% was achieved for all experiments. Cells were serum starved for 2 h prior to any indicated stimulation. M-450 tosylactivated beads (Life Technologies) were coated with anti-CD3 Ab (20% of binding capacity) and/or anti-CD28 Ab (20% of binding capacity). 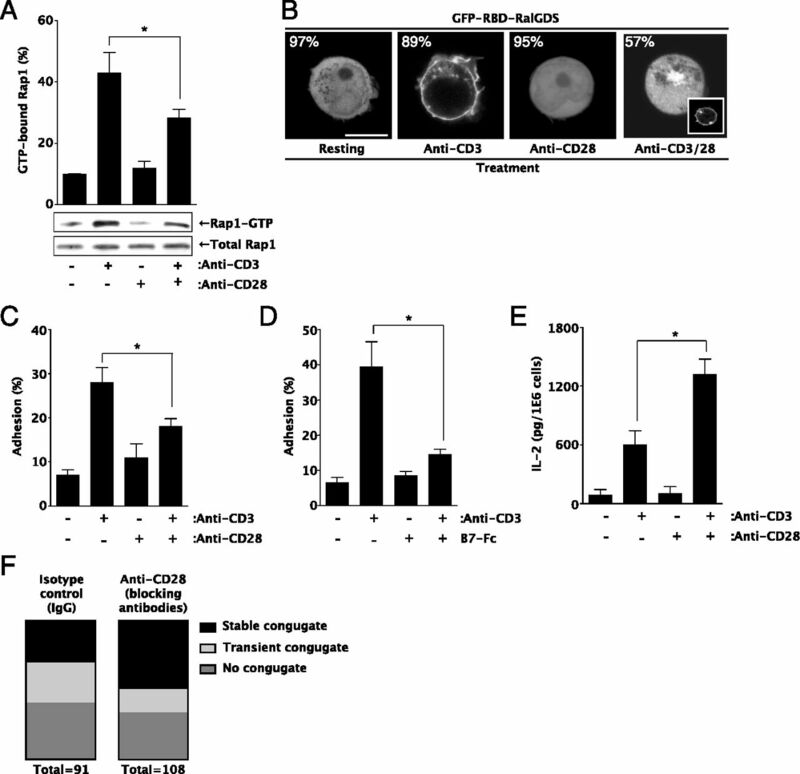 Beads coated with either anti-CD3 or anti-CD28 alone were also coated with IgG control at the same concentration as the absent Ab to maintain a consistent amount of coating Ab used to stimulate the cells. In some experiments, soluble anti-CD3 (2 μg/ml) and/or anti-CD28 (5 μg/ml) Abs were used for stimulation. For each experiment, the use of immobilized or soluble stimulation is specified. B7-Fc (5 μg/ml) (R&D Systems) was used in place of anti-CD28 Abs where indicated. Resting cells were treated with IgG isotype control. Anti-mouse CD3 (17A2) Abs and control IgG were purchased form BioLegend. Anti-mouse CD28 (37.51) Abs were obtained from eBioscience. Anti-CD28 (PV-1) and anti-CTLA-4 (C-19) Abs were purchased from Santa Cruz Biotechnology. Anti-Rap1 (3/Rap1) Abs were obtained from BD Biosciences. pcDNA-Rap1 and GFP-RBD-RalGDS constructs were previously described (6). The modified CAPRI constructs were subcloned from GFP-CAPRI (gift from Dr. Peter Lockyer, University of Bristol, Bristol, U.K.) by the use of nested primers. Primer sequences are available upon request. Plasmids were treated with an UltraClean endotoxin removal kit (MO BIO Laboratories) and verified by bidirectional sequencing. T cell adhesion to ICAM-1–coated plates was performed as recently described (9). Briefly, primary murine T cells were either transfected with GFP-tagged constructs (as indicated) or labeled with CFSE. Optical bottom 96-well plates (Corning) were coated with ICAM-1. The labeled T cells were then stimulated with soluble anti-CD3 Ab and/or soluble anti-CD28 Ab and/or B7-Fc as indicated and immediately added onto the ICAM-1–coated plates. The T cells were incubated with ICAM-1 for 15 min to allow for all cells to settle and come into contact with ICAM-1. Following incubation, nonadherent cells were then removed by vigorous serial washes. The number of adherent cells remaining was determined with a fluorescent plate reader (Synergy HT, BioTek Instruments). In each experiment, wells that remained unwashed were included to determine fluorescent input, or 100% adhesion, and this was used to calculate the percentage adhesion for each condition. Activated Rap1 was detected by the GST pull-down assay, as previously described (6). Primary murine T cells were stimulated with immobilized anti-CD3 and/or anti-CD28 Abs as indicated for 5 min prior to cell lysis. Cell lysates were incubated with GST-RBD-RalGSD coupled to glutathione beads to pull down activated Rap1. Pull-down lysates were then separated by Tris-glycine PAGE and transferred to nitrocellulose filters. Blots were blocked and then incubated with the primary Abs for Rap1 at 4°C overnight. Immunoreactive bands were visualized using the Odyssey imaging system (LI-COR Biosciences). By using fluorescent dye–labeled Abs rather than an enzymatic reaction, the Odyssey imaging system offers a linear range >4000-fold (3.6 orders of magnitude) to accurately detect strong and weak signals on the same Western blot. To calculate the percentage of activated Rap1, we used the ratio of GTP-bound Rap1 over corrected total Rap1 intensity detected (100%). Live cells were plated in μ-Dish35mm (ibidi) and maintained at 37°C (PeCon). Individual cells were imaged continuously, before and after soluble stimulation, for periods of 20 min. Images were acquired with an inverted Zeiss 700 laser scanning confocal microscope (Carl Zeiss Microimaging). Subcellular localizations of fluorescent probes were classified as cytoplasmic, diffuse with enrichment at the PM, or PM (Supplemental Fig. 1). Each experiment was performed five times. In each experiment, 100 cells were scored. To determine the concentration of secreted IL-2 following stimulation, a mouse IL-2 ELISA kit (Aviva Systems Biology) was used according to the manufacturer’s protocols. Briefly, freshly isolated primary murine T cells were stimulated with immobilized anti-CD3 and/or anti-CD28 Abs for 18 h. Following stimulation the supernatant was collected and applied to the ELISA protocol. A Fluo-4 NW calcium assay kit was used to measure intracellular calcium (Life Technologies) according to the manufacturer’s protocol. Briefly, primary murine T cells were resuspended in assay buffer and distributed throughout a 96-well optical bottom plate at the kit’s indicated volume and cell density. Plates were then incubated at 37°C and 5% CO2 for 60 min to allow the cells to settle. Following the 60-min incubation, 2× loading dye solution was added to each well and the plate was incubated for an additional 45 min at 37°C and 5% CO2. In the meantime, a solution of soluble anti-CD3 and/or anti-CD28 Abs in assay buffer was made. Following the final incubation, the plates were loaded into a fluorescent plate reader set at 37°C (Synergy HT, BioTek Instruments), and cells were stimulated with the soluble Ab solutions as indicated. Fluorescence was measured for excitation at 494 nm and emission as 516 nm continuously during a period of 9 min. Data are reported as calcium influx over time and are representative of three independent experiments. CAPRI-deficient mice were a gift from Dr. He You-We (Duke University). C57BL/6 mice were purchased from Taconic Biosciences (Germantown, NY). OT-I mice were a gift from Dr. Mike Dustin (University of Oxford). Mice were bred under pathogen-free conditions. Animal studies were approved by the New York University Institutional Animal Care and Use Committee. OT-IT cells expressing a transgenic TCR that recognizes OVA were isolated from single-cell spleen suspensions of DO11.10 mice by depletion of magnetically labeled non-CD3 cells (Invitrogen). To isolate APCs, spleen suspensions were prepared by digestion with collagenase D (100 U/ml) in HBSS for 40 min. Low-density cells were isolated by centrifugation over a 60% Percoll gradient (GE Healthcare). Cells were further enriched by differential adherence by incubating cells on 100-mm tissue culture plates in medium containing 5% FBS for 2 h at 37°C (GE Healthcare). Cells were further enriched by differential adherence by incubating cells on 100-mm tissue culture plates in medium containing 5% FBS for an additional 2 h with 100 μg/ml OVA peptide. APCs were mixed with CFSE-labeled T cells at a 1:2 ratio, conjugated by brief spinning, and after 15 min, plated on poly-l-lysine (10 μg/ml)–coated wells. Images were taken to quantify the number and the quality of the T cell/APC conjugates before and after treatment with blocking anti-CD28 Abs (5 μg/ml) as an indicator of tightness of adhesion. T cells were classified as forming no conjugate, a transient conjugate, or a stable conjugate with APCs (Supplemental Fig. 2). Values are reported as means ± SEM. Statistical analyses were performed using a Student t test. Statistical significance was defined as a two-tailed p value < 0.05. All statistical analyses were performed using the Microsoft Excel 2011 program. Because Rap1 is central to cellular adhesion (6), we tested the effects of CD28 ligation on Rap1 activation in primary murine T cells. With the goal of simulating T cell/APC interactions, we used M-450 tosylactivated beads to immobilize anti-CD3 and/or anti-CD28 Abs. In cases of stimulation with a single Ab, control IgG was used to maintain the amount of individual Ab presented to the T cells. As shown in Fig. 1A, treatment of resting cells with anti-CD3 Abs resulted in a significant increase in the levels of activated GTP-Rap1. Treatment with anti-CD28 Abs failed to change the levels of activated Rap1, but treatment with both Abs at the same time exhibited reduced levels of activated Rap1 compared with treatment with anti-CD3 Ab alone (Fig. 1A). CD28 signaling inhibits Rap1-mediated T cell adhesion. (A) Primary T cells were stimulated with immobilized Abs as indicated for 5 min and subjected to GST pull-down assay for activated Rap1. The percentage of GTP-bound Rap1 was calculated by comparison of the amount of activated Rap1 to the total amount of Rap1. (B) Primary T cells expressing untagged Rap1 and the GFP-labeled probe for activated Rap1, GFP-RBD-RalGDS, were stimulated with soluble Abs as indicated and live-imaged to visualize the localization of activated Rap1. Percentage represents predominant phenotype, whereas inset shows minority phenotype. Scale bar, 10 μm. (C and D) Primary T cells were stimulated with immobilized Abs as indicated and subjected to an adhesion assay on ICAM-1–coated wells. Percentage adhesion was calculated based on input fluorescence normalized to 100% adhesion. (E) Primary T cells were stimulated with immobilized Abs as indicated; supernatants were collected and analyzed by ELISA for released IL-2 levels. Picograms of IL-2 per 1 million T cells are shown. (F) Primary T cells were cocultured with APCs loaded with OVA peptide (both from DO10.11 mice) and number and quality of conjugates were recorded after treatment with blocking anti-CD28 Abs (Supplemental Fig. 2). All bars indicate average ± SEM. n = 3. *p < 0.05. Rap1 has been localized to multiple compartments in T cells (10). To determine where in the cell Rap1 is inhibited downstream of CD28, primary T cells expressing the probe for activated Rap1, GFP-RBD-RalGDS, were treated with soluble anti-CD3 and/or anti-CD28 Abs and live imaged (6). Cells were then classified for GFP-RBD-RalGDS localization as either cytoplasmic, diffuse with enrichment at the PM, or PM (Supplemental Fig. 1). In resting cells, the GFP-RBD-RalGDS was localized to the cytosol in most cells (97%) (Fig. 1B). After treatment with anti-CD3 Abs, most of the cells (89%) demonstrated recruitment of the probe to both the PM and to a vesicular compartment (Fig. 1B). Although treatment with anti-CD28 Abs alone did not result in any changes in probe localization, simultaneous treatment with both Abs resulted in inhibition of the observed CD3-induced trafficking of active Rap1 to the PM in most of the cells (57%), suggesting that CD28 signaling inhibits Rap1 activation largely at the PM (and not in the vesicular compartment) (Fig. 1B). Rap1 is critical for T cell adhesion, and thus we tested the effect of CD28 on adhesion to ICAM-1–coated wells. Concurrent treatment with soluble anti-CD3 and anti-CD28 Abs resulted in reduced numbers of adherent cells compared with treatment with anti-CD3 Abs alone (Fig. 1C). The CD28-mediated decrease in T cell adhesion was confirmed using B7-Fc, natural ligand for CD28, in combination with anti-CD3 Abs to stimulate cells (Fig. 1D, Supplemental Fig. 3). Therefore, the observed inhibition is not solely an effect of anti-CD28 Abs. To confirm that the classic, costimulatory effects of CD28 signaling were intact in our hands, we quantified IL-2 levels, known to increase following CD3/CD28 costimulation (3). As expected, combined exposure to immobilized anti-CD3 and anti-CD28 Abs significantly increased IL-2 secretion as compared with anti-CD3 Ab treatment alone (Fig. 1E). Because Ab-mediated stimulation diminishes the potential physiological relevance, we confirmed the inhibitory effect of CD28 by activating T cells with natural ligands expressed by APCs. Specifically, we cocultured OT-I T cells (expressing TCR that recognizes OVA) with APCs loaded with OVA peptide. Next we recorded T cell/APC conjugates after treatment with blocking anti-CD28 Abs (Fig. 1F, Supplemental Fig. 2). As shown, blocking CD28 signaling resulted in increased numbers of stable conjugates between T cells and APCs (Fig. 1F). Thus, costimulation through CD28 inhibits TCR-induced Rap1 activation and subsequent cellular adhesion in primary murine T cells. The intrinsic GTP hydrolytic activity of Rap1 is limited, and inactivation must be mediated by a GAP. We therefore hypothesized that CD28 induced hydrolysis of GTP-Rap1 into GDP-Rap1 was mediated by the GAP CAPRI (7). To demonstrate this we took advantage of T cells isolated from CAPRI-deficient mice (7). In resting CAPRI-deficient cells, the levels of GTP-Rap1 were slightly elevated compared with wild-type (WT) cells (Fig. 2A). As shown earlier, in WT cells, treatment with immobilized anti-CD3 and anti-CD28 Abs in combination reduced the levels of activated Rap1 compared with treatment with immobilized anti-CD3 Abs alone (Figs. 1A, 2A). However, in cells deficient of CAPRI, signaling via CD28 failed to reduce Rap1 activation downstream of the Ag receptor (Fig. 2A), strongly suggesting that CD28 signaling employs CAPRI. Earlier, we showed that CD28 signaling inhibited Rap1 mainly at the PM of WT cells (Fig. 1B). When cells lacking CAPRI expressed the probe for activated Rap1 and were stimulated with both soluble Abs, Rap1 was not inhibited at the PM, implying that CAPRI exerts its inhibitory effects downstream of CD28 at this location (Fig. 2B). Rescuing these cells by expressing exogenous WT CAPRI sequence (Fig. 2C) restored, to some extent, the ability of CD28 signals to inhibit Rap1 at the PM (Fig. 2B). In terms of adhesion, cells lacking CAPRI were not responsive to treatment by immobilized anti-CD28 Abs in combination with anti-CD3 Abs (Fig. 2D). 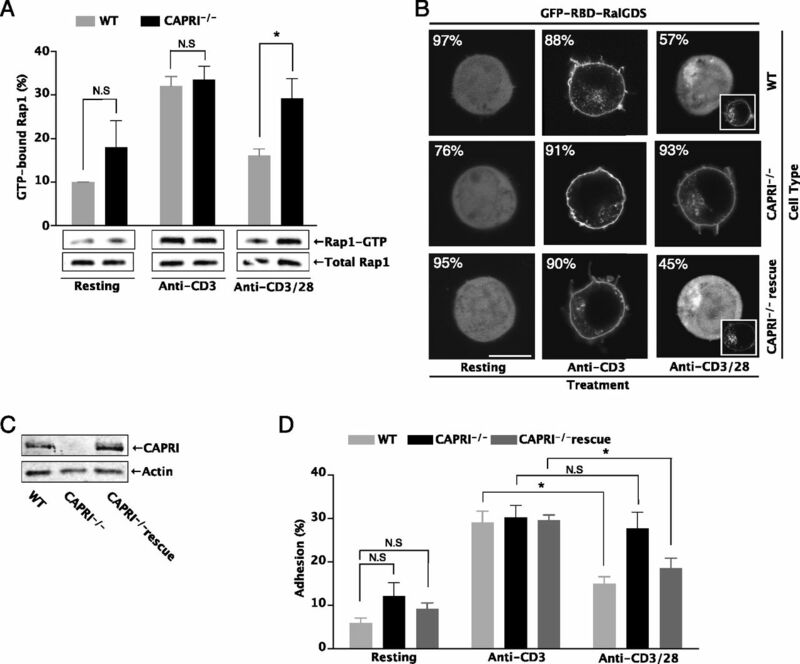 Rescuing these cells with WT CAPRI resulted in gain of reactivity to anti-CD28 Abs as measured by decreased adhesion to ICAM-1–coated wells as compared with treatment with anti-CD3 Abs alone (Fig. 2D). Overall, theses results suggest that the observed decrease in Rap1 activity and T cell adhesion following combined exposure to anti-CD3 and anti-CD28 Abs is mediated through the GAP CAPRI. CAPRI is required for CD28 signaling to Rap1. (A) Primary T cells, isolated from CAPRI-deficient mice (CAPRI−/−) and littermate controls, were stimulated with immobilized Abs as indicated followed by GST pull-down assay for activated Rap1. The percentage of GTP-bound Rap1 was calculated by comparison of the amount of activated Rap1 to the total amount of Rap1. (B) Primary T cells from WT mice, CAPRI−/− mice, and CAPRI−/− mice rescued with a WT construct expressing untagged Rap1 and the GFP-labeled probe for activated Rap1, GFP-RBD-RalGDS, were stimulated with soluble Abs and live-imaged to visualize the localization of activated Rap1. Percentage represents predominate phenotype, whereas inset shows minority phenotype. Scale bar, 10 μm. (C) Western blot shows levels of CAPRI in lysates generated from primary T cells isolated from WT littermate controls, CAPRI-deficient mice, or CAPRI-deficient mice rescued with WT CAPRI. (D) Primary T cells from the same mice were stimulated with immobilized Abs as indicated and subjected to adhesion assay on ICAM-1–coated wells. Percentage adhesion was calculated based on input fluorescence normalized to 100% adhesion. All bars indicate average ± SEM. n = 3. *p < 0.05. N.S, not significant. It has been reported that in resting cells CAPRI was localized in the cytosol, but upon pharmacological stimulation it was rapidly recruited to the PM (11). Based on this, we visualized the localization of CAPRI in primary T cells stimulated via endogenous receptors by physiological stimulus. We again classified cells as either cytoplasmic, diffuse with enrichment at the PM, or PM; in this case, classification was made based on GFP-CAPRI localization. In resting cells, GFP-CAPRI was localized to the cytosol and excluded from the nucleus (Fig. 3). Stimulation with soluble anti-CD3 Abs resulted in recruitment of CAPRI to a cytosolic compartment in 61% of the cells (Fig. 3). Stimulation with soluble anti-CD28 Abs alone did not result in any observed trafficking, but when the cells were treated concurrently with both soluble Abs, CAPRI traveled to the PM in 43% of the cells (Fig. 3). CAPRI translocates to the PM after stimulation. Primary T cells expressing a GFP-labeled version of CAPRI WT (GFP-CAPRI) were live-imaged before and after stimulation with soluble Abs. Percentage represents the predominate phenotype. n = 3. Scale bar, 10 μm. CAPRI has tandem C2 domains (C2A and C2B) and a GAP-related domain flanked by a pleckstrin homology (PH) domain and Bruton’s tyrosine kinase motif (Fig. 4A). It has been reported that CAPRI recruitment to the PM is mediated by binding of its C2 domains to membranous phospholipids in a calcium-dependent manner (11, 12). To understand whether this is the case in the setting of physiological stimulus in primary T cells, we generated versions of CAPRI lacking either the C2 domains (CAPRIΔC2AB) or the PH domain (CAPRIΔPH) and tagged them to a GFP sequence (Fig. 4A). Cells were again classified based on the localization of GFP-CAPRI within the cell (Supplemental Fig. 1). In resting cells, the distribution of the two GFP-CAPRI constructs was cytosolic, similar to WT CAPRI (Fig. 4B; 97% WT, 100% ΔC2AB, 94% ΔPH). Stimulation with soluble anti-CD3 Abs resulted in recruitment of all three CAPRI constructs to a cytosolic compartment (Fig. 4B; 69% WT, 73% ΔC2AB, 71% ΔPH). However, in the absence of the C2 domains, CAPRI failed to traffic to the PM upon treatment with soluble anti-CD3 and anti-CD28 Abs in 81% of cells counted (Fig. 4B). CAPRI lacking the PH domain was also defective in trafficking to the PM (in 58% of the cells counted) (Fig. 4B); however, it is evident that the C2 domains appear to play a more dominant role in this trafficking (81 versus 58%). These results suggest that both the C2 domains and the PH domain play a role in PM trafficking of CAPRI. 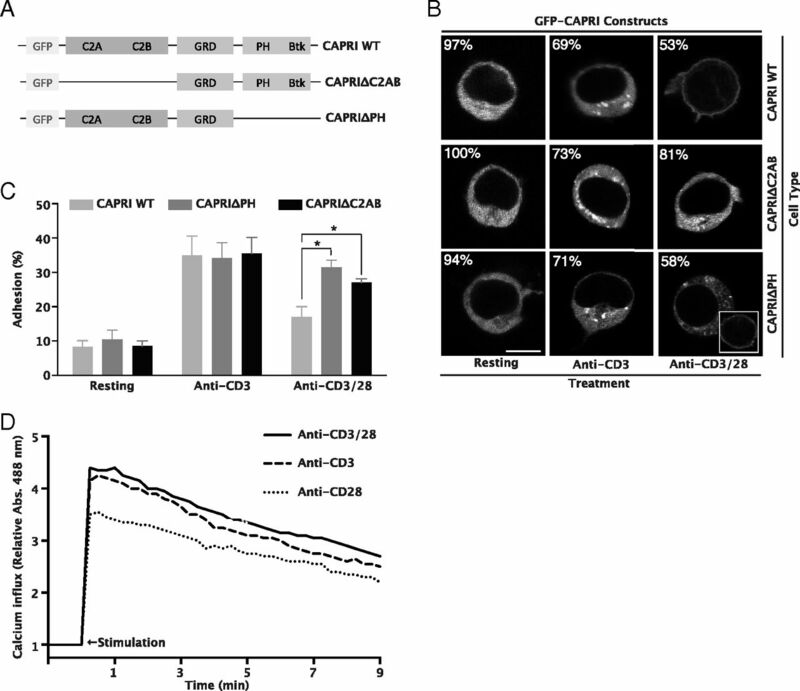 CAPRI C2AB domains are required for CD28 inhibition of adhesion. (A) Schematic of the domain structure of CAPRI. Btk, Bruton’s tyrosine kinase. (B and C) Primary T cells harvested from CAPRI-deficient mice and expressing either CAPRI WT, CAPRI construct lacking its calcium binding domains (CAPRIΔC2AB), or CAPRI construct lacking its PH domain (CAPRIΔPH) were live-imaged before and after stimulation with soluble Abs as indicated (B) or immobilized Abs as indicated and subjected to adhesion assay on ICAM-1–coated wells (C). Percentage represents predominate phenotype, whereas inset shows minority phenotype. Scale bar, 10 μm. (D) Primary T cells were treated with soluble anti-CD3 and/or anti-CD28 as indicated and calcium influx was measured over time with Fluo-4 NW using a fluorescent plate reader. n = 3. To study the contribution of these domains to T cell adhesion, the constructs were introduced into primary T cells lacking CAPRI (CAPRI−/−), and adhesion to ICAM-1 was measured. Cells rescued with CAPRI WT showed significantly reduced adhesion following stimulation with immobilized anti-CD3 and anti-CD28 Abs compared with cells rescued with either CAPRIΔC2AB or CAPRIΔPH (Fig. 4C), suggesting that these domains play a role in the ability of CAPRI to reduce cellular adhesion, potentially through the roles played in protein localization. Because calcium influx has been recorded downstream of both TCR and CD28 receptors, we questioned why CAPRI was recruited to the PM via its calcium-binding domains only when both receptors were engaged at the same time (12, 13). Cross-linking of either CD3 or CD28 receptors in primary T cells resulted in characteristic calcium influx (Fig. 4D). However, when both receptors were stimulated concurrently, the levels of the calcium influx were higher (Fig. 4D), suggesting that a specific threshold of intracellular calcium must be achieved to recruit CAPRI to the PM (Fig. 5). Model for CD28 inhibition of TCR-induced Rap1 activation. Signaling through the TCR will cause activation of the guanine nucleotide exchange factor C3G and an increase in intracellular calcium levels. Recruitment of C3G to the PM results in activation of Rap1 at this localization, and subsequently causes an increase in cellular adhesion. Costimulation through CD28 causes a further increase in intracellular calcium levels, leading to recruitment of the GAP CAPRI to the PM, where it will reverse the activation state of Rap1 and decrease cellular adhesion. In this work we established an inhibitory signaling cascade downstream of CD28 through the discovery that CD28 inhibition of T cell adhesion is mediated via Rap1 inhibition, with calcium serving as a second messenger to recruit the GAP CAPRI to the PM (Fig. 5). The potential clinical importance of these inhibitory aspects of CD28 signaling on adhesion is underlined by the observation that agents blocking CD28-stimulated signaling (anti-CD28 mAbs) have not succeeded as clinical immunosuppressants, presumably because the consequences of CD28 signaling blockade are multifarious and include blockade of inhibitory effects (8). Additionally, despite lacking a signaling system that is ostensibly stimulatory, CD28-deficient T cells (CD4+CD28−) infiltrate peripheral tissues (synovial tissue) in an autoimmune-like response, suggesting that CD28 might have a role in downregulating adhesion and trafficking to inflamed organs (14, 15). Our data that CD28 is in some aspects (e.g., adhesion) inhibitory represents a paradigmatic shift and is the first step in gaining a better understanding of specific CD28 pathways necessary to develop therapeutics selectively targeting proinflammatory pathways downstream of CD28. The versatility of calcium as a second messenger lies in the complex manner in which calcium signals are generated (11). Our data show that CAPRI is required for CD28 inhibition of Rap1, and that binding to calcium is needed for CAPRI trafficking and function. It is established that both CD3 and CD28 signaling raise intracellular calcium levels (4). Paradoxically, however, CD3 signaling alone promotes Rap1 activation whereas CD3 plus CD28 signaling inhibits Rap1 activation. If both receptors increase calcium influx, how can CAPRI respond positively to one trigger but not at all to the other? In this study we showed that there is a threshold for CAPRI recruitment to the PM. Both receptors increase calcium influx, but only the contribution of CD28 to CD3 raises intracellular calcium sufficiently to activate CAPRI. An alternative explanation that was not ruled out in our work is that activation of CD3 versus CD3 plus CD28 might stimulate calcium influx at different subcellular compartments within the cells, causing divergent effects (16). Data to support this explanation lie in the fact that stimulation via the CD3 receptor alone recruits CAPRI to the endomembrane compartment (Fig. 3). It is not likely that the duration (transient versus sustained) or the pattern (linear versus oscillation) of calcium influx controls the localization of CAPRI because all responses performed similarly (e.g., sustained and linear influx curves; Fig. 4D). Indeed, a recent report showed that whereas the related GAP, RASAL, was regulated by calcium oscillations, CAPRI was responsive to absolute levels and was refractory to oscillation (13). CAPRI is a member of the GAP1 family and as such has a catalytic domain with dual Ras GAP and Rap GAP activities (17, 18). In this study, we focused on the role of CAPRI as a Rap1 GAP and did not illustrate its function as a Ras inactivator downstream of the TCR. Earlier work by Bivona et al. (12) showed that depletion of CAPRI in Jurkat T cells using short hairpin RNA resulted in Ras activation at the PM, suggesting that CAPRI might translocate to the PM upon TCR stimulation. In contrast, our study reveled that CAPRI translocated to an endomembrane compartment, and not to the PM after engagement of the Ag receptor (Fig. 3). One way to reconcile these discrepancies is by the different methodologies used. Whereas Bivona et al. used short hairpin RNA to deplete overexpressed CAPRI in Jurkat T cells, we took advantage of primary murine T cells harvested from CAPRI knockout animals. The function of CAPRI at the endomembrane compartment is not clear. It is well established that Ras is able to signal from endomembrane compartments, and thus we propose that CAPRI inhibits Ras at that location (12). Evidence to support this is the fact that the related GAP RASAL activity toward Ras is excluded from the PM (13). Additional experiments are needed to support a model in which CAPRI specificity towards Ras and Rap1 is regulated by its spatial distribution. It has been shown that calcium-dependent dimerization of CAPRI may serve to coordinate specificity toward Ras versus Rap1 (16). Low calcium concentration resulted in monomeric CAPRI that showed stronger Ras GAP activity whereas higher calcium concentrations resulted in dimer formation that favored Rap1 GAP activity. Thus, experiments to show the subcellular localization of these forms of CAPRI are being performed in our laboratory. We thank Dr. Mark Philips (New York University School of Medicine, New York, NY) for sharing reagents, Dr. He You-We for providing the CAPRI-deficient mice, and Prof. Mike Dustin for providing the DO10.11 mice. This work was supported by the Hirschl Trust, Michael Saperstein Medical Scholars Research Funds, the New York University Whitehead Fellowship, the Colton Fellowship, and the American College of Rheumatology Investigator Award.
. 2010. CD28 co-signaling in the adaptive immune response. Self Nonself 1: 231–240.
. 2005. The B7/CD28 costimulatory family in autoimmunity. Immunol. Rev. 204: 128–143.
. 2014. Cytotoxic-T-lymphocyte antigen 4 receptor signaling for lymphocyte adhesion is mediated by C3G and Rap1. Mol. Cell. Biol. 34: 978–988.
. 1998. Costimulation through CD28 suppresses T cell receptor-dependent activation of the Ras-like small GTPase Rap1 in human T lymphocytes. J. Biol. Chem. 273: 4944–4949.
. 2000. CD28 and the tyrosine kinase lck stimulate mitogen-activated protein kinase activity in T cells via inhibition of the small G protein Rap1. Mol. Cell. Biol. 20: 8409–8419.
. 2009. Phospholipase D1 regulates lymphocyte adhesion via upregulation of Rap1 at the plasma membrane. Mol. Cell. Biol. 29: 3297–3306.
. 2005. An essential function for the calcium-promoted Ras inactivator in Fcγ receptor-mediated phagocytosis. Nat. Immunol. 6: 911–919.
. 2006. Cytokine storm in a phase 1 trial of the anti-CD28 monoclonal antibody TGN1412. N. Engl. J. Med. 355: 1018–1028.
. 2014. Static adhesion assay for the study of integrin activation in T lymphocytes. J. Vis. Exp. 88: e51646.
. 2007. Small GTPases and LFA-1 reciprocally modulate adhesion and signaling. Immunol. Rev. 218: 114–125.
. 2001. CAPRI regulates Ca2+-dependent inactivation of the Ras-MAPK pathway. Curr. Biol. 11: 981–986.
. 2003. 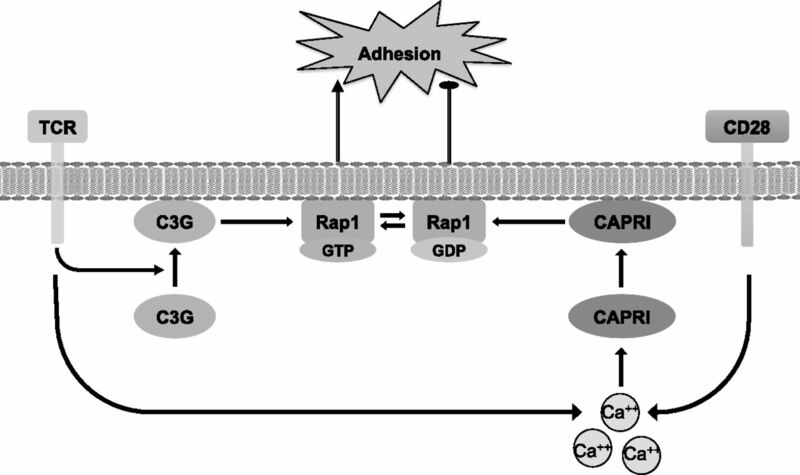 Phospholipase Cγ activates Ras on the Golgi apparatus by means of RasGRP1. Nature 424: 694–698.
. 2005. CAPRI and RASAL impose different modes of information processing on Ras due to contrasting temporal filtering of Ca2+. J. Cell Biol. 170: 183–190.
. 2004. CD28 signals in the immature immunological synapse. J. Immunol. 172: 5880–5886.
. 2010. An enigmatic tail of CD28 signaling. Cold Spring Harb. Perspect. Biol. 2: a002436.
. 2011. Ca2+-dependent monomer and dimer formation switches CAPRI protein between Ras GTPase-activating protein (GAP) and RapGAP activities. J. Biol. Chem. 286: 19905–19916.
. 2006. GAP1 family members constitute bifunctional Ras and Rap GTPase-activating proteins. J. Biol. Chem. 281: 9891–9900.
. 2009. The ability of GAP1IP4BP to function as a Rap1 GTPase-activating protein (GAP) requires its Ras GAP-related domain and an arginine finger rather than an asparagine thumb. Mol. Cell. Biol. 29: 3929–3940.